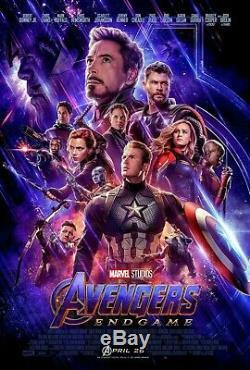 This is an original double-sided rolled movie poster for AVENGERS: ENDGAME. The back side of the poster is a mirror image of the front for use in backlit displays. The poster measures 27x40 inches. This poster is exactly like the one you might see at your local movie theater. Layer 1: The poster will be put inside 2-millimeter poly tubing to protect the image on both sides. Layer 2: The poster will be put inside a cardboard tube with bubble wrap at both ends. This is a preorder item. Please feel free to check my feedback.